Leon Russell, Steve Morse & Pat Travers Lead A Stellar Cast Of Music Superstars On This Tribute To The Legendary Allman Brothers Band! Also features Commander Cody, Molly Hatchet, The Oak Ridge Boys, Artimus Pyle Band, Reese Wynans (Double Trouble), Tinsley Ellis, Robben Ford & more! Los Angeles, CA – One of music’s biggest and most influential juggernauts gets the respect and admiration they so richly deserve on this brand new tribute album available May 27th from Cleopatra Records! 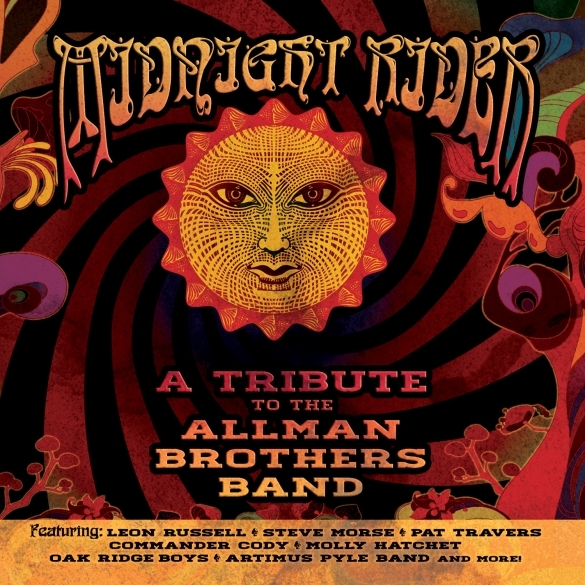 Featuring an eclectic group of rock, country, and blues legends, Midnight Rider – A Tribute To The Allman Brothers Band offers energetic new covers of the classic hits “Midnight Rider,” “Ramblin’ Man,” and “Whipping Post” as well as one of the most famous instrumental songs in all of rock music “Jessica,” alongside many more Southern fried favorites! Speaking for a next generation of blues rock artists, Eli Cook offers both high praise and a word of advice: “The Allman Brothers’ story of talent, hard work, and blind devotion to creating an honest and unique sound is one that every artist should study and imitate. Just as they cut their teeth on Taj Mahal, Cream, Elmore James, and all the great early R&B artists, today’s players are wise to woodshed with the Eat A Peach and Live At The Fillmore albums.” Or just pick up a copy of Midnight Rider – A Tribute To The Allman Brothers Band and let these boys show you how it’s done! This entry was posted on Saturday, May 24th, 2014 at 12:00	and posted in Allman Brothers Tribute, Press Release. You can follow any responses to this entry through the RSS 2.0 feed.